“I’ll change. I swear I will”. 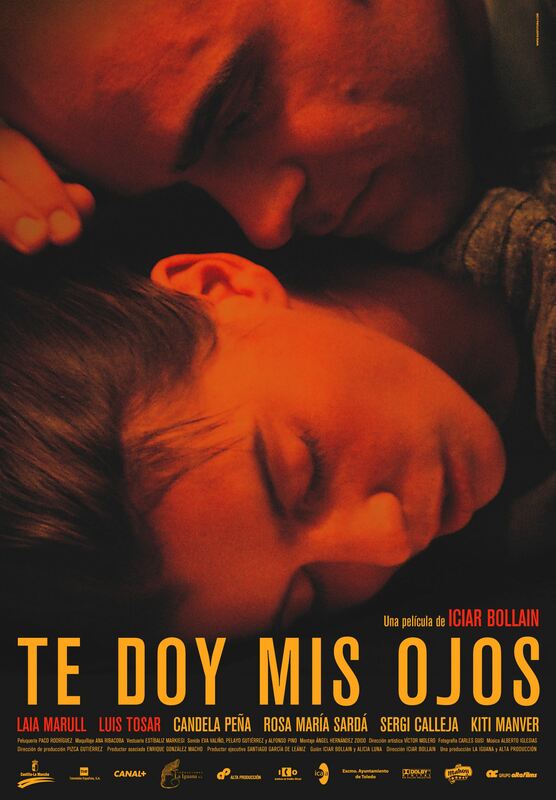 These are some of the promising words that Antonio (an amazing Luis Tosar) utters to his wife Pilar (Laia Marull) in the film “Te doy mis ojos” just a few days after she escapes from home with her son. Pilar is one among thousands of victims of domestic violence in Spain. But in spite of fearing for her life she – unconvincingly – tells herself that Antonio is madly in love with her, to the point of confronting her own family. Things start to change when Pilar gets a job in an art gallery. This position helps her to meet new friends and gain a previously non-existing feeling of self-confidence. However Antonio, a brute and short-tempered man, will try to prevent Pilar from having a life without him. Director Iciar Bollaín succeeds in tackling the extremely delicate subject of domestic violence in “Te doy mis ojos”. The result is a beautiful and credible story in which the characters are portrayed as objectively as possible. Pilar – a frail victim of her husband’s frustration and bitterness – evolves into an independent woman who not only dares to fantasise about a new life but becomes strong enough to make her hopes and desires come true. This evolution takes place naturally as we follow Pilar’s steps towards her long desired freedom. Interestingly, the tragic side of the film is balanced out with the more appealing subject of art. “Te doy mis ojos” is set in the Spanish city of Toledo, famous for being the sixteenth century painter El Greco’s living residence. This amazing landscape gives the film a softer tone, as the characters walk around the city. We witness Pilar as she achieves a sense of self-knowledge thanks to her work in an art gallery. We learn about her feelings and strength through her analysis of classic paintings as a tour guide, something that an extremely jealous Antonio is not able to cope with. “Te doy mis ojos” works perfectly as a social drama. The story is told beautifully even if some scenes may result uncomfortable to sensitive audiences. Bollaín successfully reflects the anxiety that victims of domestic violence experiment on a daily basis while opening a door to a hopeful future.